What is the .NET Web ADF? ArcGIS 10 is now available! See the What's new in version 10 document for more details. 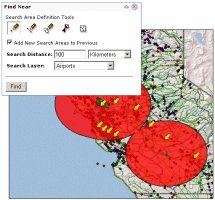 The ArcGIS Server Web ADF for the Microsoft .NET Framework (.NET Web ADF) is an AJAX-enabled framework for building powerful, easy to use applications that display, analyze, and edit GIS data stored on a central server. It includes a set of Web controls, frameworks, and APIs that can be used to build an application from the ground up or to customize an application you created using the ArcGIS Server Manager Web application. Use the Getting Started topics, Tutorials, and Samples to start working quickly and effectively with the Web ADF for .NET. A detailed Library Reference is also available if you need more information about components and their properties, methods, and events. 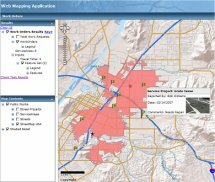 Create production ready Web applications quickly using the Web Mapping Application template. Add and configure tasks, or create custom tasks to support common workflows that generate attribute and spatial results. Utilize client and server graphics and customize map tips and templates to create a responsive and aesthetic user experience.